The Mauritius weather is very pleasant and allows the visitors to have perfect holidays all the year round. You can decide to come to Mauritius at any time of the year and you will be sure to have a comfortable weather during your stay. Because Mauritius is not far from the Tropic of Capricorn, the sun is at its highest point longer than in other destinations around the globe. This is why Mauritius benefits from many hours of bright sunny skies all year round. The weather and local climate of the island is of a micro climate, meaning that it can be raining in one part with dark grey skies, while the other part enjoys clear sunny skies. Even if it is raining in the morning, the weather can change quite quickly and the sky will become clear blue in no time. So, tourists can enjoy the excellent tropical climate all the year round, the white sandy beaches and the turquoise lagoons of the Island of Mauritius. Mauritius has only two seasons: Summer is from November to April and winter is from May to October. Throughout the year, there is not much difference between the weather conditions; there are minor changes in temperature between the seasons. There are also no well-defined rainy/wet and dry seasons. The months of October and May are commonly known as the transition months. The humidity is quite high during summer time mainly on the coastal part of the island. The hottest months of the year are usually December, January and February when also cyclones can occur. The temperatures of the sea are higher during summer and in winter the temperature will drop a little. In general, along the coastal areas, temperatures are 3 to 5 degrees higher than on the central plateau, with the western and northern regions of the island warmer and drier. During Summer (November to April) the temperature is around 27° C on the coast and around 22° C on the Central Plateau. During Winter (May to October) the temperature is around 22° C on the coast and around 19° C on the Central Plateau. December, January and February are the warmest Months, with average temperature of around 27-28°C. 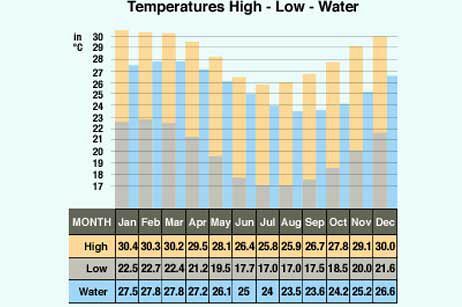 July is considered the coolest month of the year with average temperature of around 20-21° C.
Here, you can find out more about Temperatures in Mauritius including figures and charts. In summer, the sun is seen from five o’clock in the morning until seven o’clock in the evening. In winter there is less sunshine, usually from six o’clock in the morning until six o’clock in the evening. The North enjoys one hour more of sun during most of the year. In the Central Plateau and the Eastern region there is one hour less of sun during winter and during the wet summer months. Here, you can find out more about Sunshine, Sunrise and Sunset in Mauritius including figures and charts. It is important to know that in Mauritius it can rain in one area while only a few kilometers away the sun is shining and no cloud is in sight. If you wake up in the morning with a gray sky, don’t worry. Go for a shower, have breakfast and probably by then, the sky will be clear blue. The annual rainfall which is about 1100mm on the North coast increases drastically on the Central Plateau. Here, you can find out more about Rainfall in Mauritius including figures and charts. The temperature of the sea is higher during the summer, and in winter time the temperature of the water will drop a little. Sea temperatures are generally pleasant throughout the year ranging from 27-28° C in summer to 23-25° C in winter. Strong anticyclones in winter may occasionally cause the sea temperature to fall by 2 or 3° C.
Here, you can find out more about Sea Temperature and Conditions in Mauritius including figures and charts. 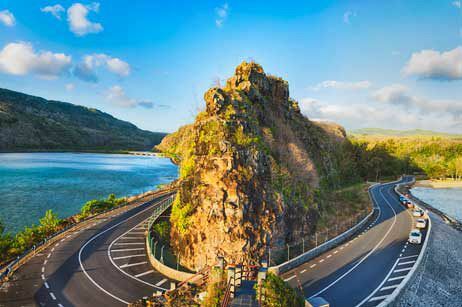 The wind in Mauritius is usually blowing quiet steady from easterly directions and the most constant trade winds occur in winter time from May to September. During summer the winds mainly affect the south and east coast. The north and west regions are protected from these winds by the mountains, so during winter these areas have the best beach weather. If you are planning on staying on the east and south coasts during winter, you should take into consideration the trade winds and wind chill. Here, you can find out more about the Winds in Mauritius including figures and charts.